Cool news for all you horror fans who have been waiting to see Darren Lynn Bousman's MOTHER'S DAY. Anchor Bay has acquired North American distribution rights to the long delayed film that stars Rebecca DeMornay, Jaime King, Deborah Ann Woll and Shawn Ashmore. 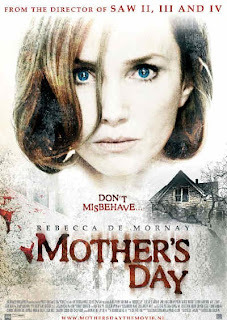 There's no confirmed release date yet but word is Anchor Bay might release it next Mother's Day, May 13th, 2012. That's kind of a fitting date if you ask me.